April is National Pet Month and with many dog owners around the UK dedicated to making their vehicle safe and accessible for their canine friends, we’re sharing some of our own car pet-proofing tips. Lining your car’s boot will help to protect it from getting wet and grubby with mud and loose dog hairs. My liners are available with bumper protectors to prevent any scratches and damage when your dog climbs in and out the car. Old towels and blankets will work a treat too! Quick Dog Driving Tip – Don’t ever leave your dog unattended in the car and always ensure they have easy access to food and water throughout the journey. Hatchbacks and estate cars are always a smart option for car owners as their spacious boots will provide your dog with a comfortable and convenient place to sit. Simply remove the parcel shelf, push down the back seats and invest in a dog guard to prevent your dog from jumping over the seat whilst you’re on the road. Quick Dog Driving Tip – The Peugeot 3008 Crossover is the perfect dog friendly vehicle with 512 litres of boot space! Got more than one dog to accommodate? Push down the seats and the SUV will provide up to 1,604 litres of room, large enough to hold up to three dogs at any one time. If your dog is trained and capable to be left on the back seat, purchase a harness to ensure they’re secured safely and can’t move around whilst your concentrating on the road. Quick Dog Driving Tip – When taking your dog on a long car journey plan regular stops for small walks and toilet breaks. A pet carrier is an ideal option for smaller dogs and can be secured using a seatbelt on one of the car’s seats to prevent it from sliding around. 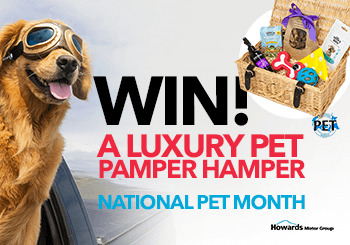 To celebrate National Pet Month we’re giving away a pet pamper hamper on our Twitter and Facebook page – to enter simply share a photo of your dog enjoying a drive in your car. We’ll be announcing the lucky winner on the 24th of April so be sure to keep a close eye on our social pages for competition updates!